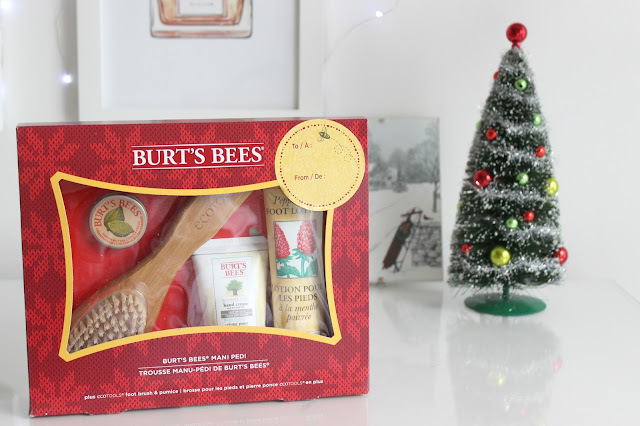 Home / Burt's bees / Christmas / fresh / presents / stocking stuffers / Last minute stocking stuffers! It's been five months since I last posted on here. School and work were insanely busy, but I'm off for a few weeks on Christmas vacation! I thought I would start off super simple and work back into blogging by posting a quick last minute stocking stuffer post! Whether you're buying for a secret Santa or stock stuffers for the girl in your life, then the Fresh Sugar Christmas range is something you must check out. They're a great, safe option for most people on your list. The first picture features two amazing lip balms. With the weather well below zero, it's a great kit to have as it means you can keep one on your nightstand and one in your purse. The Fresh Sugar lip balms are amazing as well. They're not the most pigmented lip balms, so they're perfect to effortlessly touch up throughout the day. They come in a wide range of colours (petal is my personal favourite), and are very moisturizing. And as a bonus gift (to be fair, this would have fit in my old stocking) is the Burt's Bee's mani pedi kit. It comes with hand a food creams, cuticle cream and a foot brush. Add a few nail polishes to the set and you have the perfect at-home spa kit for someone on your list. Thanks for reading along, and I hope to be back more frequently over the coming months.